Lock in a great price for Lancaster Arts Hotel – rated 9.1 by recent guests! The rooms were well lit which was great for working. The rooms were so aesthetically pleasing too. Breakfast was nothing special. Hard boiled eggs and cold burritos. There was a waffle machine but nothing you can't get at any chain. Room and shower were nice. Really liked being able to use the YMCA across the street. Neighborhood was far from clubs and shopping. Cold long walk in the winter. The hotel room was unique. We stayed in the deluxe queen which I liked. The bathroom was not a typical hotel bathroom. It had style and flair. Pancake maker at breakfast is a great contraption! Came to surprise my husband for his birthday! Had a wonderful time. Everything was perfect down to the beautiful rose/chocolate, water by the nightstand and eye covers we could take home! Thank you for a wonderful time at your hotel! The breakfast was excellent with a wide variety of healthy options. We loved the little personal touches especially the turndown service and the rose and the mints on our pillow at bedtime. The hotel was like a bed and breakfast. Just beautiful. All staff was very friendly and helpful. Breakfast great. Water at bedside nice touch as well as coffee mugs and glasses in room. great l0cation for visiting F&M Campus, and downtown area. within walking distance to many places including restaurants. Hotel room was clean, but.. the hotel should plan for a deep cleaning from time to time. Cobwebs were found at top of window sill in my room, the only reason we saw them was because we tried to close the window. We realized their was a draft. Our window did not completely shut, so check windows too! Every year on this week-end, my cousin and I come to Lancaster to shop. Normally, we stay at the Old Cork Factory, and have for years, but decided to change a little and try a different place this year. We have not been disappointed. This place has everything we loved about the previous one, plus it is more economical to boot. The brick wall in the room is gorgeous, and the bathroom is the most elegant we have seen. The original wood floors and sturdy beams add a beautiful touch to the finely detailed room. Lancaster Arts Hotel This rating is a reflection of how the property compares to the industry standard when it comes to price, facilities and services available. It's based on a self-evaluation by the property. Use this rating to help choose your stay! 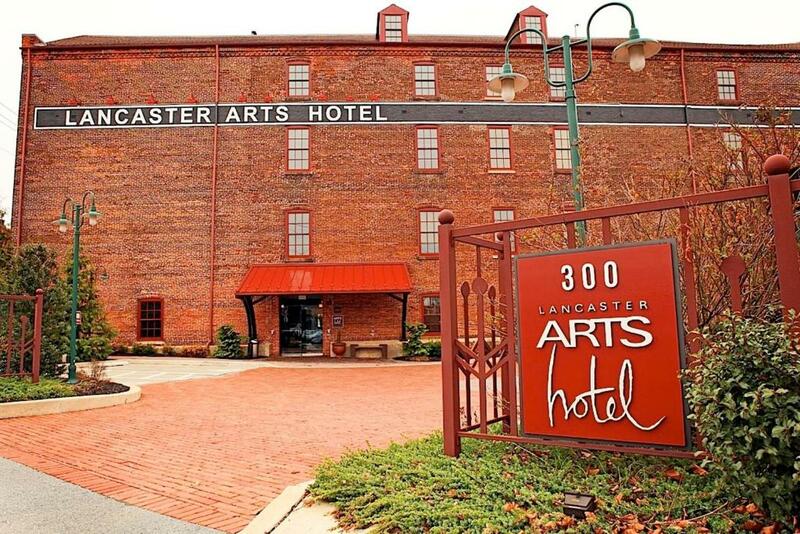 Experience modern luxury combined with unique, art-inspired accommodations at this boutique hotel located in Lancaster, Pennsylvania just minutes from Pennsylvania's Dutch Country and Hershey Park. Lancaster Arts features original works of art, especially creations by local artists, in the lobby and all guestrooms. All rooms are completely smoke-free and offer amenities such as 330 thread-count Egyptian sheets, designer toiletries, flat-screen TVs and iPod docking stations. John J. Jeffries, Lancaster Arts Hotel's on-site restaurant, is named for a tobacco inspector from the 1890s. The restaurant strives to support local farms and organic ingredients. Specialty items from the menu include locally made cheeses and locally raised buffalo. When would you like to stay at Lancaster Arts Hotel? Features a wine refrigerator, flat-screen TV and plush Turkish bathrobes. Features a wine refrigerator, desk and ergonomic chair. This room includes a refrigerator and flat-screen TV. This suite has a spa bath, bathrobe and iPod dock. This suite features a spa bath, bathrobe and iPod dock. Situated in the heart of downtown, Lancaster Arts Hotel features deluxe accommodations with unique surroundings. All of the rooms, from the lobby to the suites, are filled with original works of art, especially that of local Pennsylvania artists. The Lancaster Arts Hotel also has an on-site restaurant called John J. Jeffries, which works with local farmers to provide produce, as well as adhering to the use of many organic foods. Lancaster County is home to Pennsylvania Dutch Country, which usually evokes images of the Amish, handmade quilts, and horse-and-buggy rides. But there is so much more to this interesting area, in particular, historic Lancaster City. The Lancaster County Convention Center at Penn Square and the Franklin & Marshall College are just blocks from the Lancaster Arts Hotel. House Rules Lancaster Arts Hotel takes special requests – add in the next step! Lancaster Arts Hotel accepts these cards and reserves the right to temporarily hold an amount prior to arrival. Walls were thin. The snoring was so loud next door I rolled over thinking my husband was in bed with me. He wasn’t there. The humming sound in room 212 that was not remedied by waiting for the fan to turn off as suggested by the front desk . The hum was a 60 Hz and the first thing my daughter noticed too when she came to see our room. Staff was not very helpful. Some nice art but most was a little lowbrow. Charged $16 for a cheese plate at the bar. Overpriced. Breakfast needs more meat and fresh fruit. It would also be nice to have a choice of scrambled/boiled eggs instead of cold hard boiled eggs alone. Allowing folks to check in before 3 would be lovely if you could create that flexibility. The room was a bit noisy. Also the closed shades allowed a lot of light in at night from street lights. The parking was a bit odd, since when the lower garage filled up, one had to drive up a ramp showing a green light to the upper level. BUT I never got a green light to leave the garage, I only got a red light, so I had someone watch for cars coming up for me and I blew my horn as I came down! The breakfast buffet was nothing fancy, but the coffee was good and hard to go wrong with a toasted bagel with Philadelphia Cream Cheese and a fresh orange/banana. The workers in the breakfast area were terrific and kept everything renewed and clean.